Melt chocolate chips and stir until smooth. Remove from heat and stir in cream cheese until smooth. Fold in the cool whip until well blended. Cover and refrigerate until set or overnight. 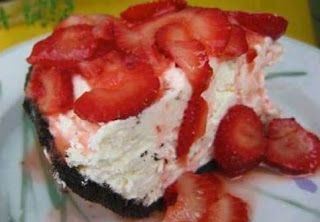 Serve with your choice of berries on top, preferably with some berry juice, as on shortcake.